Following theories are to be discounted. 1)The men are waiting for the arrival of their leader. It is often questioned whether or not the men are assembled to receive a shipment of booze that was called in by a hijacker. If it was a mere booze shipment Moran wouldn't have had to show up at all. His agents Ted Newberry and Bennie Bennett handled the booze part of the Moran gang. The idea behind the meeting may have been about a betrayer amongst Moran's group, which was possibly why the Moran gang had planned a meeting that morning. Right after the massacre, Northsider Ted Newberry switches over to the Capone camp. He is seen walking around with one of Capone's diamond studded belt buckles. Edward "Teddy" Newberry. Probably betrayed the Moran gang to inherit the lucreative Northside booze business as a Capone agent. 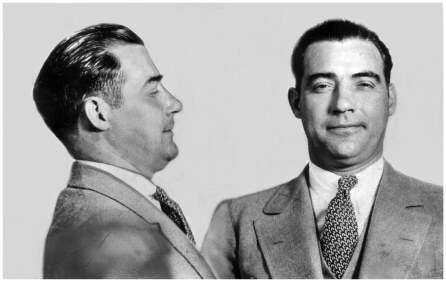 He fell out with the Capone mob under Nitti's rule, and was whacked in 1933, possibly by Ralph Pierce and Sam "Golf bag" Hunt. Both Capone hitmen were seen riding around near the Indiana area where Newberry's body was found. 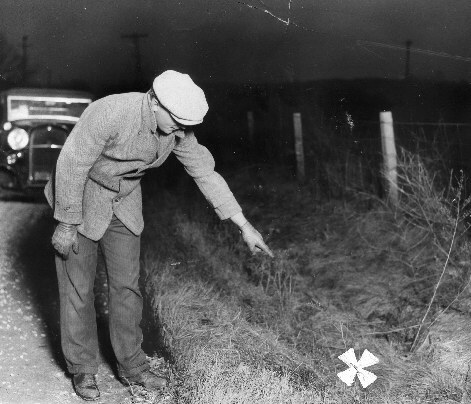 X marks the spot for Ted Newberry by the side of the road in Chesterton, Indiana. 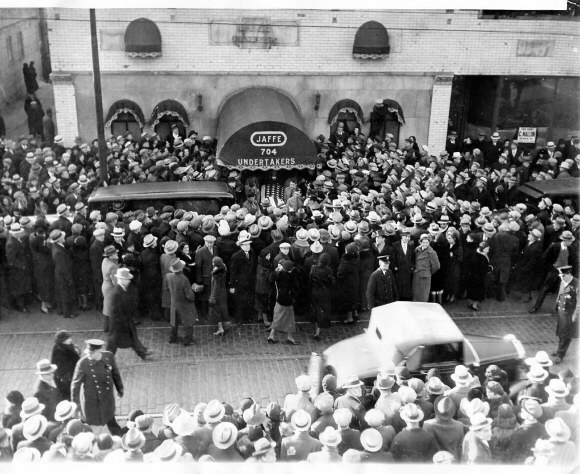 January 11,1933, Ted Newberry's funeral with military honors from the American Legion. Newberry had served in the Navy during the first war. His silver bronze casket was banked with two hundred floral pieces. For that answer the question should be why would the dead men be dressed to the nines to unload a truck of booze? The men were really there to discuss and take action against a traitor in their midst. Moran had been shot weeks earlier in an assassination attempt. the wild, and not widely accepted, but for a brief time, widely reported. It was the guess of one federal Prohibition official who was soon transferred and later fired. 2) Some think the Moran boys were there to prepare for a road trip to Detroit in order to hiijack incoming Purple Gang's bourbon whisky cargoes destined for Al Capone's Chicago. The men were not dressed in adequate winter clothing to travel all that distance just to hijack some whiskey in the freezing cold. The FBI by this time received many crackpot letters, as they did by the hundreds with every case. This happened especially around the Valentine massacre anniversary, when the newspapers reminded the public of it as still remaining unsolved. The public became amateur sleuths. One in particular was sent in by Frank Farrell. The January 28th 1935 written letter contained information as to William Davern jr., a former fireman who was shot in a known gangster hangout called the C&O Cabaret and Restaurant at 509 North Clark Street. He later died a month later. Farrell's letter claims that William "Three Fingered Jack" White, who was a cousin of Davern, was told by Davern at the county jail (remember that at this time Davern is on his deathbed) that one of the Gusenberg's had shot him. Jack White then lured the Gusenbergs in the garage at 2122 North Clark and killed them along with everyone inside as a raged revenge for his cousin's demise. I checked in with Capone era Chicago gangland expert and author John Binder and asked him his thoughts on the matter. Why doesn't the Farrell letter make any sense? from the public regarding crimes. 2) CPD did its own investigation, talking to eyewitnesses and collecting evidence, and very quickly focused on Fred"Killer" Burke as the prime suspect. 3) The Farrell "Theory" (perhaps better called the Farrell Assertion) does not explain how Fred Burke ended up with the machine guns used in the Massacre (one of which was used to kill Frankie Yale in NYC IN 1928, why Byron Bolton and Jimmy "the Swede" Moran (who was an associate of Claude Maddox) served as lookouts, why Maddox and the Circus Gang disposed of the two cars involved, why Chicago police found evidence in Maddox's office that he arranged to bring Burke and his crew in to do the job, and various other known facts about the killings on North Clark Street. Are we to then believe that Jack White killed Yale in 1928, when he was not working for Capone and in jail? (SEE BELOW). 4) Names and basic details, such as how people are related to one another, in the Farrell letter are incorrect (Which reduce it's credibilty). For example, Davern's mother was not the sister of Jack White's father. Davern's birth mother, born Anna L. Gillespie, was the sister of White's mother (who was born Mary Gillespie). I've reconstructed parts of the Davern and White family trees to determine just what the family details were. involved in the famous March 1928 attempt on McGurn's life). Chicago Police records of ballistics expert Calvin Goddard's findings in relation to the William Davern Jr. killing. jail to communicate with "Jack" White. his conviction for killing Forest Park officer Edward Pflaume. Therefore, Jack White was not anywhere, killing anyone on February 14, 1929. In 1926, White was a stickup man who did bank and payroll robberies. No contemporary newspaper articles list him as involved with organized crime. That came in early 1930 when he joined Red Barker. They eventually became the labor racketeering chiefs of the Capone gang. View the actual Tribune story here below of White being in jail. to be dead or in prison by 1926). Q) Is it possible that White was able to bribe someone at the jail so that he could slip out and perform the crime? A) The Farrell letter itself says nothing about White being in jail in February of 1929 or of bribing his way out. It just notes that he was there at the end of 1928. Coroner Bundesen, who Farrell contacted before writing to J. Edgar Hoover, probably dismissed Farrell's assertion as soon as he checked the jail records, and found out that White did not get out until July of 1929. But more directly on the subject of bribery, Frank Lake and Terry Druggan had been in Cook County jail on the very minor charge of bootlegging and spread some money around so that they could come and go during their incarceration in 1925. They are the only criminals I know of during this time period who bribed officials so that they could freely leave the jail, which shows that it was an isolated problem, and there is no evidence they committed any crimes while they were gone from the jail. In fact, they were accompanied by a guard or prison official (according to the jail records) when outside the jail. Ultimately, that's not the type of thing that can be easily hidden. When the information got out, there was a MASSIVE scandal. For that incident, a federal judge sentenced Cook County Sheriff Peter Hoffman to one month in the Du Page County jail and Warden Wesley Westbrook to four months in the De Kalb County jail in October 1925. Hoffman and Westbrook were ruined by this episode. It's hardly plausible that the same thing went on after that scandal, especially with White, who was a convicted cop killer and sentenced to life in prison in 1927. View the Chicago Crime Commission's jail records on "Three fingered"Jack White. Put yourself in the place of the warden or some other jail official. If you took money to let White out and he eludes his guard, he's not going to come back. He's going to flee rather than serve life sentence. In which case, you're an accessory to his escape. You would likely be crucified for that. Therefore, would you take money so Jack White could leave the jail, especially after what happened to your predecessors? Chicago American, January 21,1927. 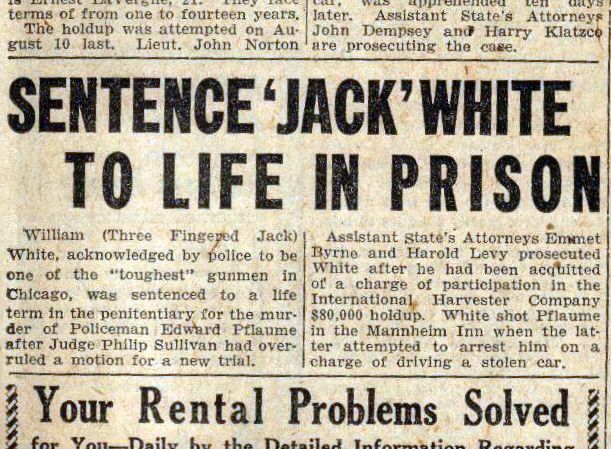 Jack White sent to prison for killing a policeman. He is released from jail in July of 1929. Certainly, there are no reported cases of other convicts bribing officials to let them leave the jail in the period after October 1925. This is due to massive reforms after the Druggan - Lake scandal. A citizen's committee brought Edward Fogarty in as warden, from out of state, in 1926. Sheriff Graydon, who replaced Hoffman when he resigned, "Allowed Fogarty a free hand and a virtual civil service system was set up. Grafting, dope smuggling and other evils were promptly eliminated at the jail" (Chicago Tribune, June 12,1929). Fogarty remained in charge until June 1929. The bottom line is this: it would have to be proven (and not just assumed) that after the Lake and Druggan jail scandal Jack White was let out of Cook County jail -- either without a guard or he eludes his guard -- on February 14, 1929. This interview section was constructed after a recent media examination of the Farrell assertion, and the many email inquiries that followed. View by clicking news report below. There you have it! Ask questions, research and research again. Seek the advice of those who have dedicated decades to this subject and who really know their stuff.